Heavy lift company Weldex has introduced Hyster ReachStackers for the handling of wind farm components at the Port of Mostyn in North Wales. Supplied by Barloworld Handling, the reachstackers provide quicker, more efficient and economical handling of components, compared to traditional lifting methods. The Port of Mostyn has become a major base for the offshore wind power generation industry and it has supported several major wind power projects over the last 5 years in the region. The wind farm components are manufactured in Denmark and transported to the port on ships where they are unloaded to be stored until they are ready to be erected. 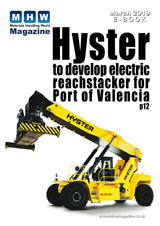 Supplied by Barloworld, two customised Hyster RS 46-41L CH ReachStackers operate in unison, lifting the 100 tonne tower sections from either end. A special attachment is fitted to the reachstacker booms allowing the wind turbine tower sections to be transported from the quayside to storage faster and more efficiently. Barloworld Handling, UK distribution partner for Hyster, has an experienced team of big truck specialists that worked with Weldex to specify the optimum handling solution. The reachstackers are also required to individually handle 50 tonne hubs for the wind turbines with a special attachment, and Barloworld worked closely with Hyster’s Special Engineering Department to ensure the reachstackers provide full flexibility for Weldex. "Reliability is critical in this operation to ensure ships are unloaded and reloaded quickly and safely" Eddie says, explaining that the erection of the wind turbines is a seasonal activity. Barloworld engineers with specialist experience of big trucks provide local dedicated service support and maintenance for the Hyster ReachStackers with full parts support and training. Barloworld is one of the UK’s largest materials handling suppliers with more than 1,000 staff nationwide, and is one of the leading suppliers of big trucks and related services to UK ports.